Delicious scratch-made cookies and treats, baked fresh daily and delivered same day throughout the Denver Metro area. Gift boxes, platters, themed baskets, custom logo or decorated sugar cookies and more! April is the month to get on over to The Colorado Cookie Company for our hoppin’ new Cookie of the Month – The Mini Egg Melty. You Know Who packed this buttery, moist cookie with chocolate mini eggs thinking to hide them. Well, we found them and want to share this chocolatey, melty marvel with the world! Don’t miss this opportunity to taste the Easter Bunny’s favorite cookie! 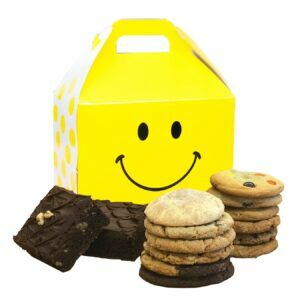 Our small multi-themed cookie boxes make a sweet treat in two options: one dozen classic cookies with two brownies or sixteen classic cookies, the choice is yours! Its a perfect gift for any occasion! "Same day delivery across the metro-area"
Another perfect gift option! Choose from our standard assortment, or our classic & signature cookies by the dozen. Our standard assortments include melt-in-your-mouth soft classic cookies, fudgy brownies, decorated sugar cookies, a chewy rice krispy bar, and buttery shortbread cookies! Cookie, Brownie, Party Platters! Great for meetings, events or gifts for a favorite office staff! Our Market Box is the perfect choice for fresh and delicious gifts with a clean, professional look! These customizable gift baskets are perfect gifts for business or for personal occasions!